Welcome back! This week we’re up perhaps the most often confused part of the computer, the RAM. Short for random access memory, the RAM functions similar to a kitchen bench. In the same way the larger your kitchen bench is, the less often you have to go to fridge/pantry for ingredients; and therefore the faster you work; as going to the fridge uses time where you are not working. This analogy transfers well to the concept of RAM in a modern computer, the more RAM you have the more data your computer has rapid access to. This means that the memory of your computer is a temporary but extremely quick storage, opposed to your hard drive/solid state drive, which as permanent but orders of magnitude slower. However there is more to this than simply having than having more = more performance, even though this concept seems to be the prevailing misconception among the public. Back in the late 90’s/early 00’s when computers had 256 MB – 2 GB of RAM and operating systems took a decent chuck of that to simply operate, adding more RAM did have a noticeable gain in performance as 3rd party software had access to more memory. Modern computers come with at least 8 GB of RAM (at least they should) with higher performance machines having access to 16 GB – 128 GB. More RAM is useful up to a point. That point is when the maximum usage of your software is using the majority of your RAM, meaning that if the operating system takes 30%, and your software takes the remaining 50%, you have a good buffer of 20% to allow for any sudden jumps in usage. As for the actual usage, modern browsers (notably Google Chrome, and now Firefox and Edge) have the capability to use a large amount of RAM quite quickly. This is because they are opening each new tab is a new process that is independently stored in the memory, this leads to greater web performance at the expense of memory usage (which is fine, that is the purpose of the memory). Certain workloads, most notably 3D content creation (though the use of software packages such as Adobe CC Suite, or similar software) can have quite large memory requirements due to the amount of data that needs to be held in the memory. Note: Everything beyond here is intended for readers with an interest in memory, users who build their own computers, or anyone who wants to understand what the people at the computer shop are saying. An average computer user will be more than content with 8 – 16 GB of RAM. DDR stands for double data rate and is a type of data transmission standard. Like most things in new technology the newer standards are better, however in this case the differences to be gained are at best minor (as THIS article shows). In general simply by RAM that matches the type your CPU can address. There is none-to-little to be gained by selecting a CPU specifically for the ability to access DDR4 memory. In reality there is a large amount of differences between DDR3 and DDR4 however the vast majority are electronic and engineering changes beyond the scope of this article. 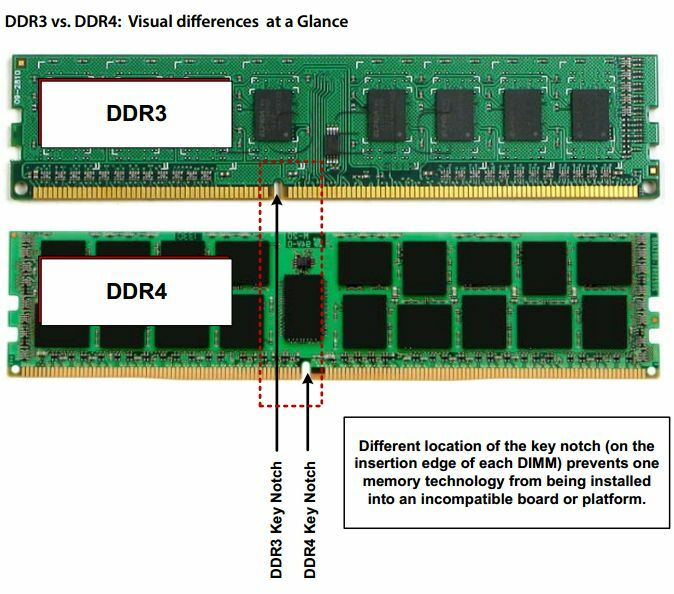 Comparison of the difference in notch location of DDR3 and DDR4. After a memory row has been used and data cleared from it, it needs to closed so that a new row can be accessed.